Contests where winners earn the chance to be called the “best” or “favorite” drum up a lot of interest. Think of all the excitement over your local best of [INSERT YOUR TOWN NAME HERE] campaigns where people nominate and vote on their favorite restaurants, spas and advertising agencies; or even over something as big as the Oscars and Grammy awards. Needless to say, these best-of contests are popular. In this customer success story, we’ll explore the campaign setup, learn more about what Cooper’s team did to meet their goals, and share the contest results. 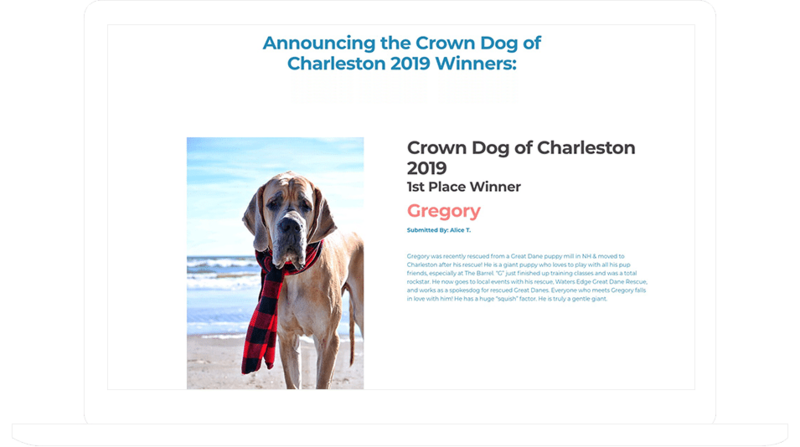 From January 18 through March 11, 2019, Charleston Dog Walker gave proud pet parents the chance to show off their fur babies in their Crown Dog of Charleston photo contest. The public voted to help select the top 10 entries from all submissions. After that, a panel of judges selected the top five entries, with these then proceeding to a final round of voting. Aside from bragging rights, the top three winners came away with a variety of prizes from contest sponsors, including gift certificates for Charleston Dog Walker services, lawn cleaning services from Doody Calls, dog food and toys from Dolittles, and more. 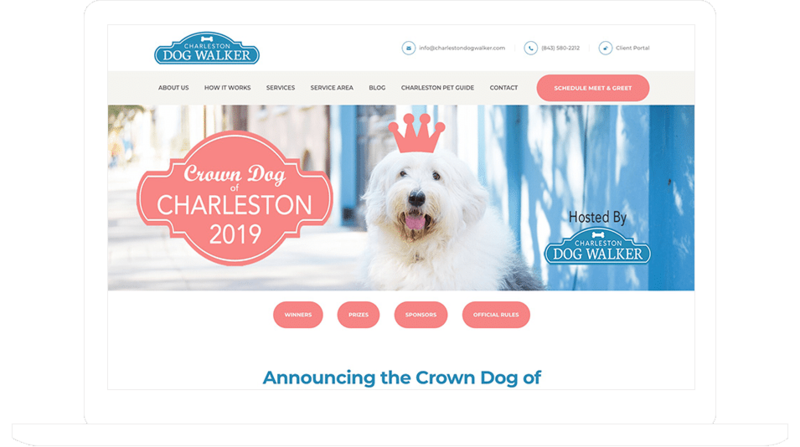 Charleston Dog Walker collected entries from January 18 through February 7, 2019. To enter, proud dog owners visited www.crowndogofcharleston.com and filled out the form. The form submission included a photo of the pup, a bit of information on why the dog should be the Crown Dog of Charleston, and some helpful remarketing information (such as email address, city and name). After the entry period was complete, the first round of public voting took place. From February 8 through February 24, 2019, people could vote on all entries to the contest. Voters could come back every 24 hours to vote. Using both voting and the random entry selector allowed Charleston Dog Walker the chance to ensure winners were not selected by popularity alone, which helps account for any advantages an entrant might have had simply due to the size of their network. Once the five finalists were revealed, the public had a second chance to vote. The second round of voting took place from March 1 to March 10, 2019. Once again, people could vote once every 24 hours. The option to search for an entry within the voting gallery. The entry form was straightforward. Entrants were asked a number of questions about their dog and themselves, then they could submit. Immediately after form submission, entrants received an autoresponder to confirm their entry and provide additional contest information. Their entry was then displayed on the campaign. Charleston Dog Walker used our time-based visibility settings to automatically stop showing the entry form and enable voting at midnight on February 8. Contestants received a scheduled email later on February 8th to let them know that voting was open and to encourage them to share their entry with their friends and family. Voters were allowed to vote once per entry every 24 hours. Reminders to vote were sent on February 14th, 22nd and 24th. Voting was disabled at midnight on February 25th. After the first voting period, the judges had five days to choose five finalists from the top-10 vote getters. During this time, Charleston Dog Walker sent entrants an email to say the top 10 have been decided. The email also included an invite to the Crown Dog of Charleston Awards Ceremony and Yapper Hour. All entrants were invited, regardless of their dog making the top 10 or not. After the judges made their decision, the top five entries were displayed via a second Voting Widget. Charleston Dog Walker sent out an email announcing the top five finalists and encouraging people to vote. Folks whose dogs were finalists received different emails to let them know their doggies made the cut. Once again, time-based settings allowed the voting to start at midnight on March 1st and end at midnight on March 11th. During the voting period, people could use the Search Widget to search the 150+ contest entries for the doggos they wished to vote for. When someone searched for an entry, the Search Widget displayed the entry (or entries) within the Voting Widget for which the entry information (e.g. dog name) matched the search criteria. Voters clicked the heart icon to cast their vote for the entry they searched for. Looking for something similar? You can set up a multi-stage contest of your own using our Photo Contest template or our Multi-Stage Photo Contest template. The results for Charleston Dog Walker’s campaign are impressive. They received 155 entries, and those 155 entries generated 9,901 votes. 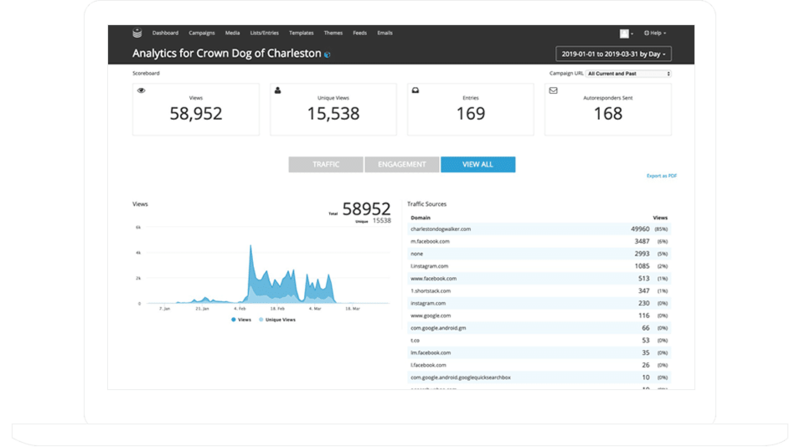 Charleston Dog Walker’s brand awareness increased due to the 58,686 views their contest received. Of those 58,686 views, 15,485 were from unique visitors (that’s 26%!). Those repeat visitors are sure to remember Charleston Dog Walker the next time they need a walker or sitter. Even more, the contest was shared via the Share Widget over 486 times. This contest wouldn’t have been as successful without the Search Widget. The Search Widget allowed voters to easily find the entries they wanted to vote for. When you have multiple pages of entries, it can take voters quite some time to sift through each page to find a specific entry which may lead to abandonment. When a user shares a specific entry, that entry is the first to appear in the voting gallery, but not everyone will take the time to share theirs. Instead, folks often share the campaign itself and not their entry. The Search Widget ensures an entrant isn’t missing out on potential votes by giving their friends and family an easy way to find their entry. When you run a contest where people win an honor or title of some sort, you’re bound to see a lot of participation. This type of contest incentivizes entrants to share their entries, which can generate a lot of traffic from voters, which in turn gains you brand awareness. If you do run a contest with a lot of entries and voting is involved, be sure to use the Search Widget to make it easier for voters to find the entry they are looking for.